Highway 51 between Tulsa and Stillwater was the route I took in college, driving it so many times that I knew the landscape by curve in the very curvy road. They’ve straightened it out, as it was way too dangerous for a road that was driven by college kids in all states of a hurry. They’ve added a turnpike which lets you out on the other side of town and is a nice drive, the one that I usually take. Sometimes, I take the old route, just for the heck of it. This week, I had seen a bit of an old movie, “The Doolins of Oklahoma,” made in 1949 and starring Randolph Scott as Bill Doolin. The real Bill Doolin didn’t look like Randolph Scott, being a rough looking little guy. The only photo I’ve seen of him shows him dead with about twenty gunshots in his chest. Lovely. He was also not any kind of a hero, having formed his own gang, The Wild Bunch, the same one of legend status. 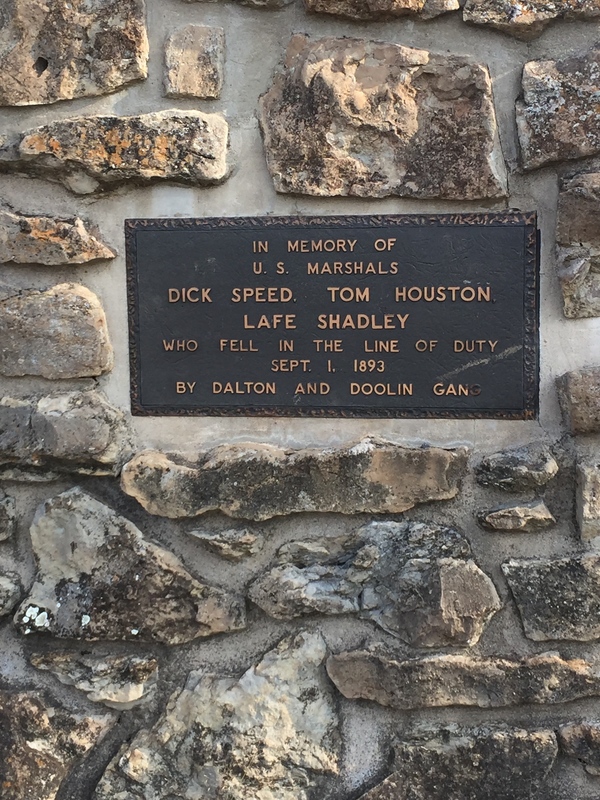 And those guys spent a lot of time in Oklahoma, along with the Dalton gang and others. We were the wild west, after all. 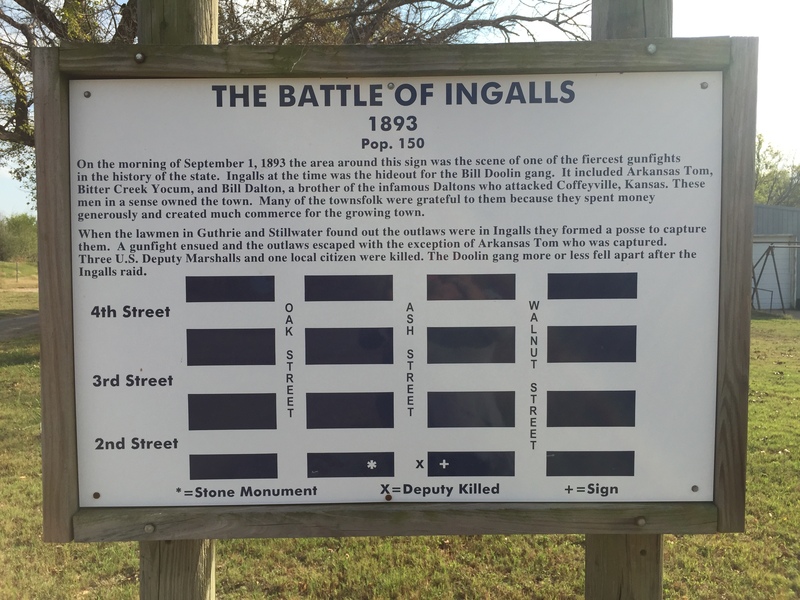 Just outside of Stillwater, right off Highway 51, it turns out that the town of Ingalls was the site of one of a big gunfight, the Battle of Ingalls. You can look up the details, but it seemed like I needed to see what was there, knowing it wasn’t much. It was just about 2 minutes off the road, a road I’d driven so many times over the past 50 years. 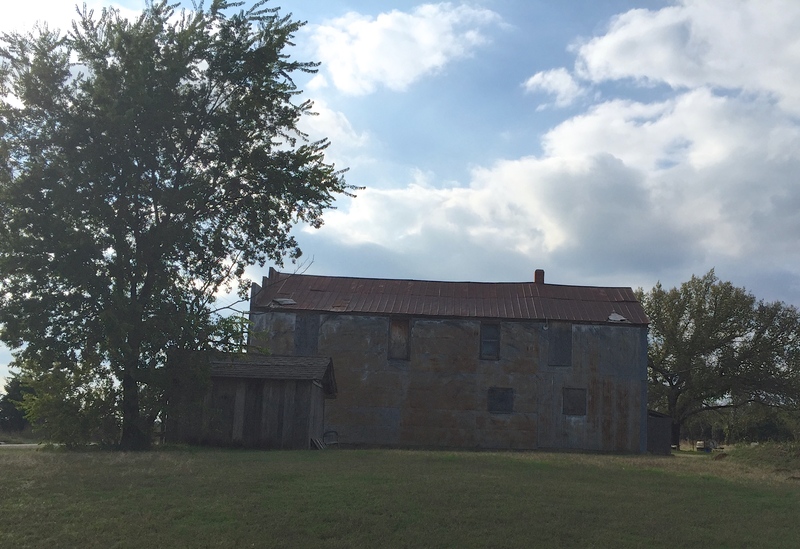 I turned onto Ingalls Road and headed for the one intersection that is left, passing Dalton Lane, a scattering of houses. Nothing much to speak of out here. 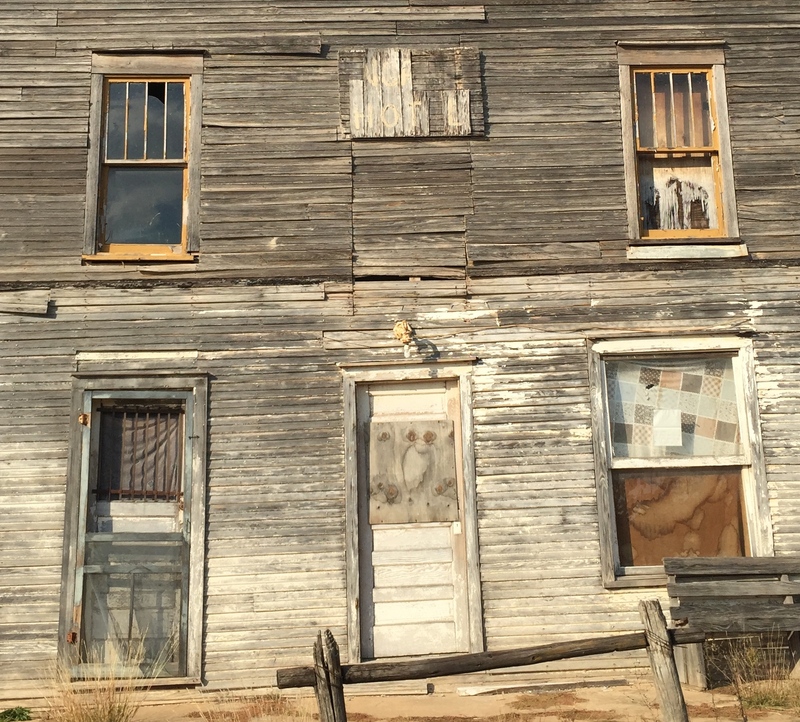 Ingall was a land rush town, one that never really took off. At the time of the infamous battle, the population was 150. All that’s left now are a school, a fire station, a few houses, many with cars in the yard, and a bit of history. Here’s what’s left of the main drag from the late 1800s. When you turn the corner, there is a little general store. Two dogs ran to greet me from the new house behind and waited to see what I was doing, licking my feet as I snapped pictures. Surely they’ve seen other visitors, although the residents haven’t done anything to make this into a tourist stop. Nothing at all. 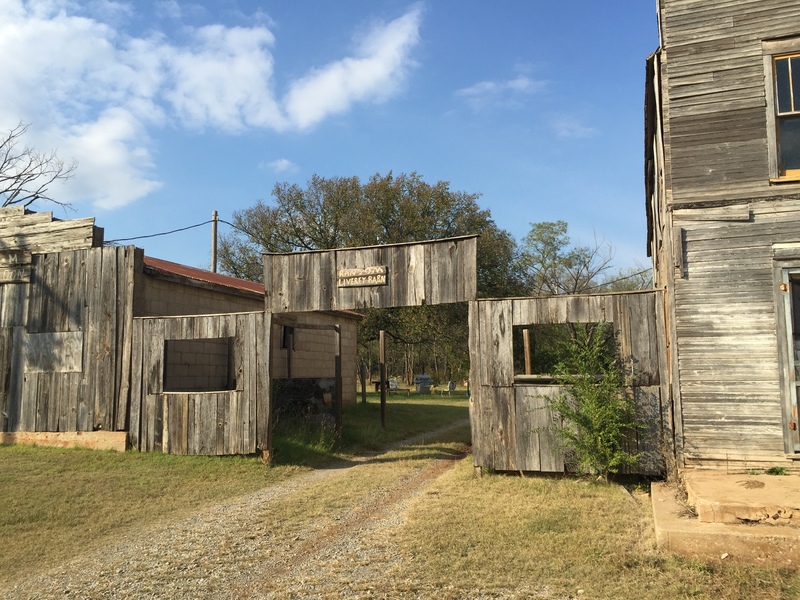 Beside the drive was the rest of the street, left as it was…the Ingalls Hotel with hitching post out front, livery barn and saloon. That’s all that’s left. The hotel is big for this little town. I guess it was full of desperados, hanging out. Who else would be coming here? The livery barn next door has only the front left, but you can see how far back the hotel goes. Not very plush, even in its heyday, I bet. Then, there’s the saloon. You can paint your own images of this place when it was alive. Not very big. But then, I’ve seen lots of old saloons and they aren’t anything compared to the Hollywood images we grew up with. 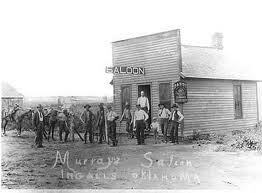 Here’s the guys hanging out at another Ingalls saloon, back in the day. 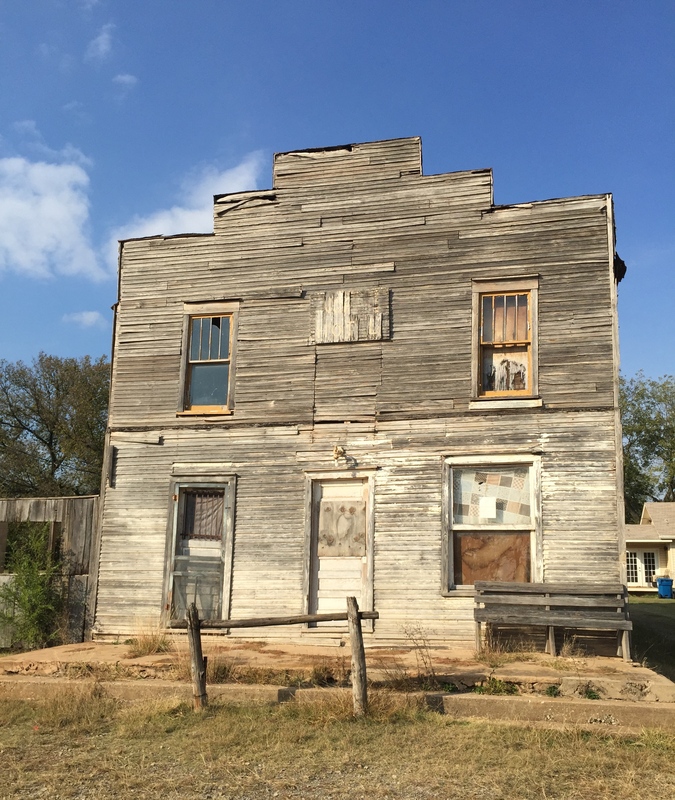 Of course a town like this had to have more than one saloon. 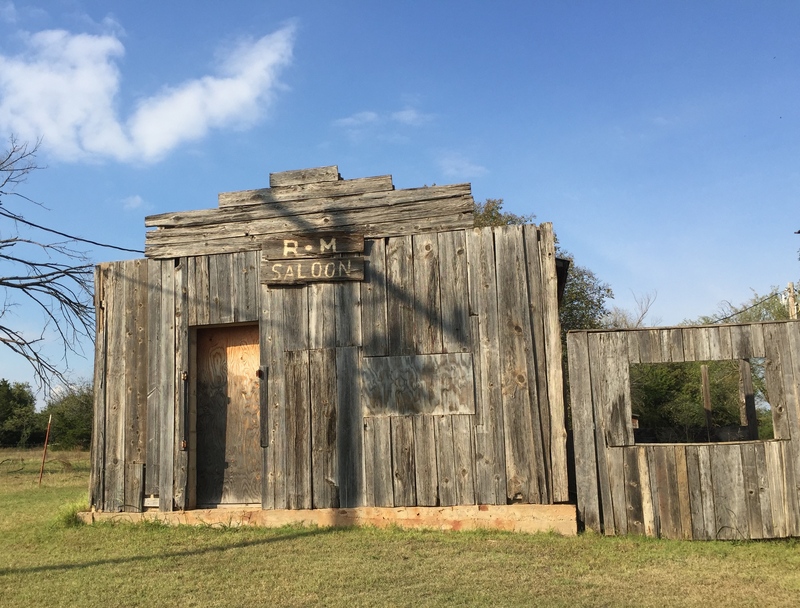 It was a pretty day, so I drove past the R & M Saloon, where the road turned to dirt and turned around at the sign that said Private Property, Do Not Enter! That was tempting. Going the other way up the street, I spotted what looked like a monument, and drove towards it. There was a fire station on one side of the street with a sign in front of it and a house on the other corner with a monument. Otherwise the town had a few houses and trailers scattered. 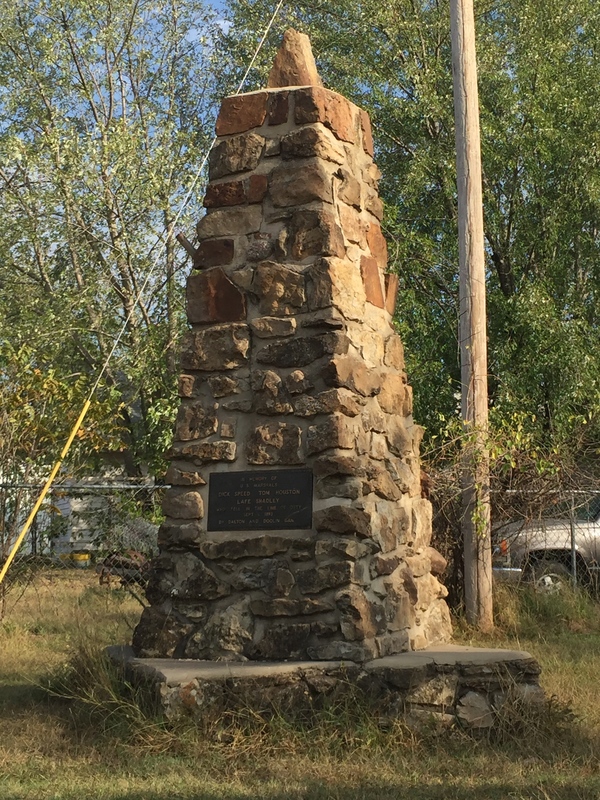 Here’s the monument. And the sign that tells the story from the citizens of Ingalls point of view. I bet the people in Ingalls appreciated gangs. Nothing else would ever happen there. 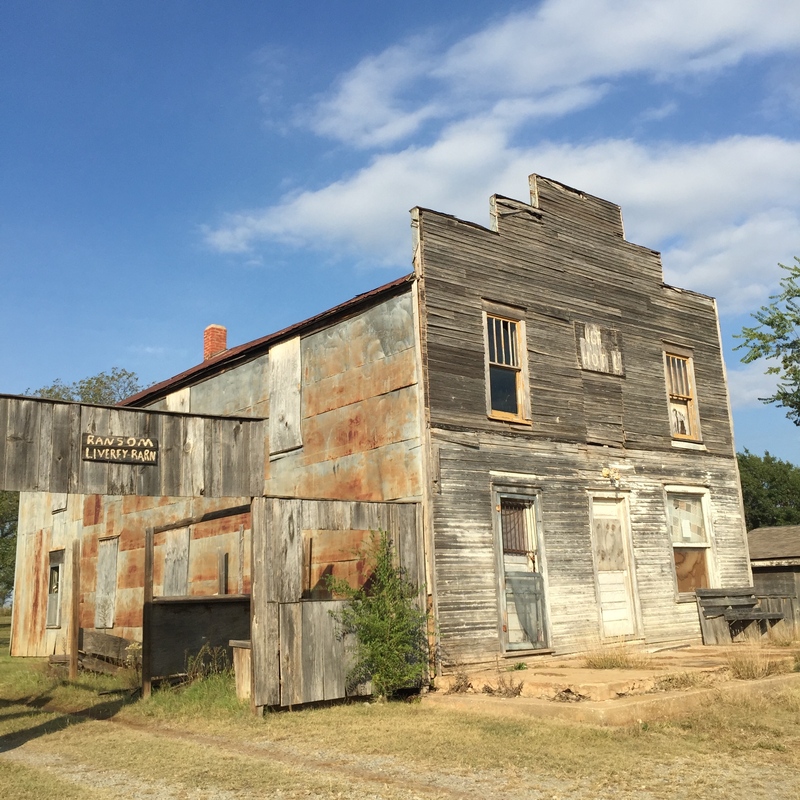 Leaving town, I looked back at the hotel, rusting in the sun with the little general store by its side. Nothing else is likely to ever happen in Ingalls. Ever. I drove past Dalton Lane on the way back to Highway 51, then turned and passed Doolin Road on the way out. They named streets after the outlaws, not the lawmen. Isn’t that interesting? I wonder what other bits of history I’m driving by every day. It’s fun to discover them, more fun than learning the dates back in some dull history classes I sat through. No wonder I’m all for historic preservation. We all need to listen to the stories these buildings can leak to our imaginations. Treasures all around us…if we look. Thanks for the tour. 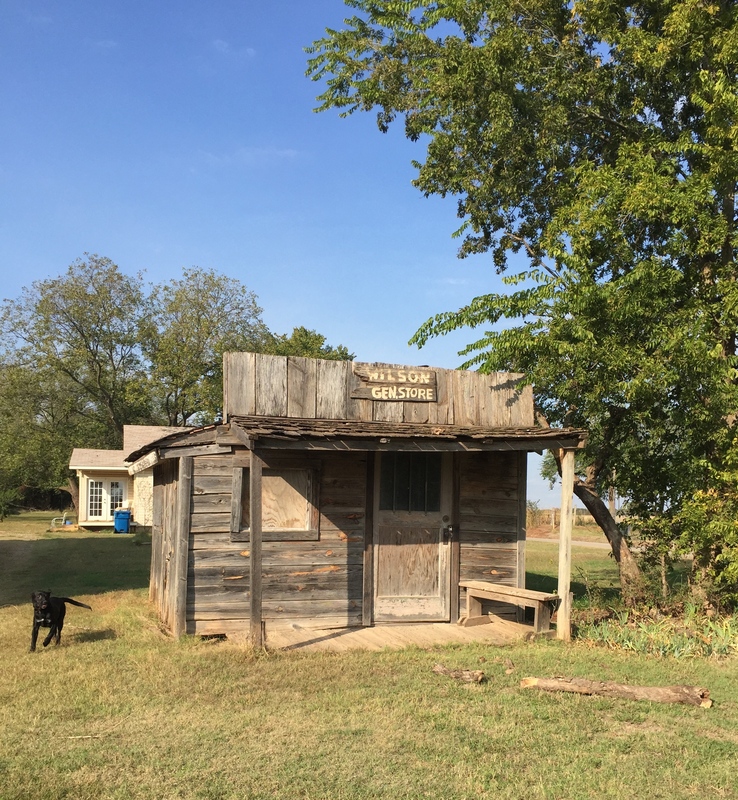 My daughter found it the same: Billy the Kid’s house is almost a shrine today and Sheriff Pat Garrett’s house is hardly noted. I wish I could remember which great author made the statement that America’s always had its heroes, and they are almost always taken from the criminal class. What a great comment. What a weird truth and what does it say about us? Thanks for sharing. 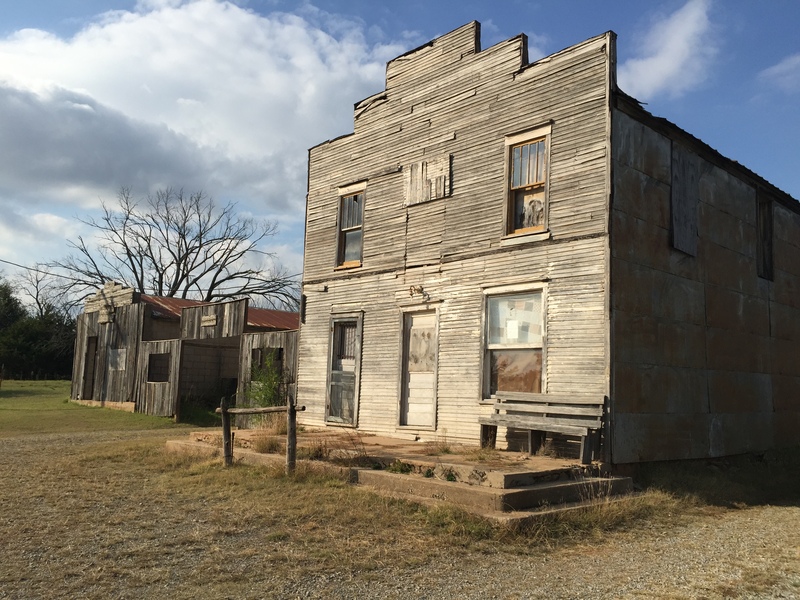 A little info about Ingalls: the buildings at 1st (19th Ave) and Ingalls Rd./Main St. are replicas of each building involved in the gunfight. A reenactment usually is held in these buildings. The “school” is a ccommunity center/senior center. The streets mentioned, Doolin and Dalton Lanes, are completely unrelated to the town. Also, the entire block between Main and Walnut Streets and 1st and 2nd Streets was home to a Ford factory in the 1920s. And, the “private road” used to be part of a neighborhood of Ingalls called Signet. The name coming from when they opened the second post office from the 1920s named Signet. When the post office closed, the name was changed back. Great information. On my last visit, we found bullet holes in some of the wood. I wonder if they used some of the original wood for the replicas as this would be hard to duplicate, especially the places where the shots came in from the side. I wondered about the “school” so this answers that question. I know the other streets are unrelated to the town since they’re down the road, but obviously named for the gangs. Interesting about the Ford factory. Ingall has quite an interesting history! Thank you for sharing!